San Diego Comic-Con, Day 1: Still Alive The huge fan convention that is San Diego Comic-Con kicks off today. NPR's Petra Mayer and Mallory Yu are there, and their look at Preview Night includes fandom, puppets and the aspirations of girls. 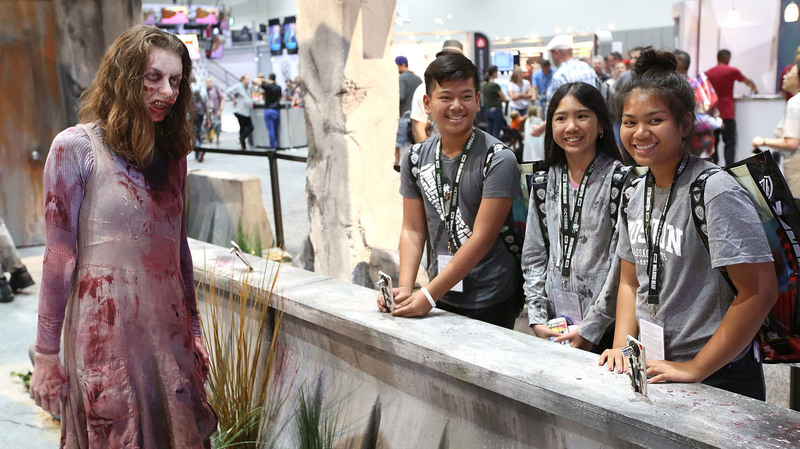 The Walking Dead's Our World booth — so far, we feel more like the people on the right. That will change. Petra: Ah, the fresh hopefulness (a New Hope, even) of the first day of San Diego Comic-Con! Your feet don't hurt (yet), your nose isn't peeling (yet) and you haven't faced down the dark night of the soul that comes from acknowledging your deep desire to elbow aside that five-year-old dressed as Wonder Woman to get into the line that might let you buy this year's favorite toy — if they don't sell out before you get to the front. Tough luck, little Amazon. I like to play Spot the Con-Goer the minute I get to the airport in DC — there are always a few people around, and you sort of size each other up, looking for those nerd shibboleths that let you know the other person is One Of Us. On my plane this morning, I spotted some interesting hair (possible), a woman with a fine line in Storm Trooper-themed accessories (almost certainly) and another woman with a Captain Marvel costume hoodie (OH HELL YES). We looked at each other and nodded — we all know where we're going. And a lot of us are going to line up at Hall H — that's the giant, holds-thousands ballroom where the big names come to hold court. It's like H is for Holy of Holies — the inner sanctum of nerd-dom. People line up days in advance, camping on grassy strips under special tents set up just for that purpose, and I like to go talk to them (and then be very gratified when the first people in line are MY PEOPLE, that is, Doctor Who fans). 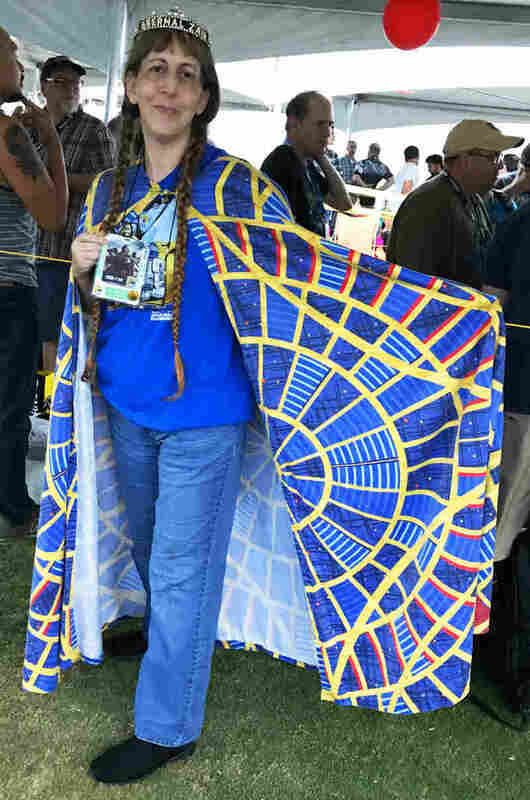 Marvel, which usually dominates Hall H, isn't here this year, but that didn't seem to bother the people in the line, who were there for everything from Doctor Who to A Discovery of Witches to Predator. But they were also there for the strange foxhole bonds that form when you're camping out with hundreds of fellow fans.I spotted people who remembered me from last year (Hello, Mike Beato from Riverside, Calif.! I hope your family lets you go to the Predator panel). I met new people, too, like Mike Garcia, also a Californian, who was there with his crew and a very elaborate camp to wait for the Breaking Bad cast reunion: "Snacks, bug repellent, toiletries, everything. Anything you need, we got it." He made sure I knew that the next guy in line had jumper cables, if I needed jumper cables. I began to think these line-campers would do real well if a sci-fi-appropriate apocalypse hit. But remember what I just said about finding your people? Walking down the line, I spotted a flash of something weirdly familiar, something deeply nerdy but not from San Diego — there was a woman in line wearing a cape printed with a very familiar pattern: The hideously tacky primary-color abstract wagon wheels that adorn the carpet of the Marriott Marquis in Atlanta, where Dragon*Con is held every year (moviegoers may recognize the building, too — it's the tributes' training facility from the Hunger Games movies). I used to go to Dragon*Con, for almost a decade, and I know that carpet well, from bleary post-costume-party nights and from early-morning trips to the pool. Apparently, I'm not the only one — Eternal Zan, as she introduced herself, is a member of the Cult of Marriott Carpet, and she leads the Cult's annual parade. There's probably something deep and meta here about the universal connections you make in fandom, about how no matter how strange and small the thing you love, this is the place where you find other people who love it. But I'm really jet-lagged, so I'm going to hand things over to my partner in con-crime, Mallory Yu. Mallory: While Petra was talking to nerds already waiting for the next Hall H panel, I was just arriving in San Diego (sometimes, you need an extra half-day before plunging into the chaos of Comic-Con). There's an infectious energy in the air, and it only intensifies the closer you get to the Convention Center. The crush of people at the center can be overwhelming — I'm not a huge fan of crowds — but it's hard to feel anything but anticipation, seeing people with colored hair and Doctor Who shirts, in casual cosplay, in their finest nerd regalia. In the exhibitor hall, my girlfriend and I were admiring (and critiquing) Marvel's 1/16th figurine collection of some of their most famous characters: Iron Man, Captain America, Thor. As I was taking a photo of a sculpt of Silk, a Korean-American superhero in the 'Spider-Verse', two girls ran up to ooh and ahh over the figurine next to her, of Spider-Gwen. After the two talked about the characters' costumes, one turned to her friend and declared, "I like the girls because they're better than the boys." And I have to say, for a moment, I felt a little envious of these girls, who get to grow up with female characters like Silk and Spider-Gwen, who have their own solo books and are just as strong and interesting as the boys. What I would have given for a Silk book when I was that age. But with new books like Marvel: Rising or DC's Super Hero Girls, it's heartening that a new generation of young girls does have those books, and loves them. Comic-Con festivities famously spill over into the rest of downtown San Diego - and even though it's only Preview Night, tonight was no exception. 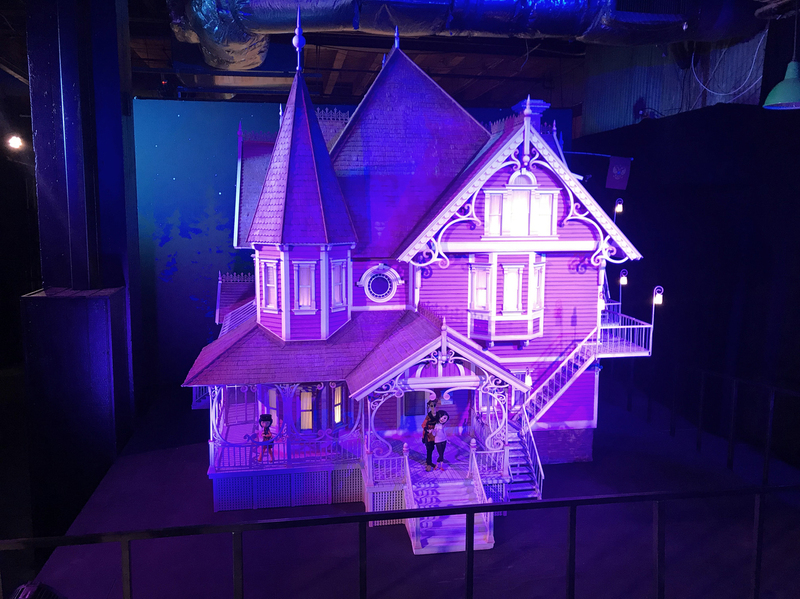 Stop-motion animation studio Laika was hosting a party to celebrate its second SDCC installation. Teri Hatcher, the "Other Mother" herself from the studio's film Coraline, made a guest appearance and joked, "Coraline was the best thing I ever did!" 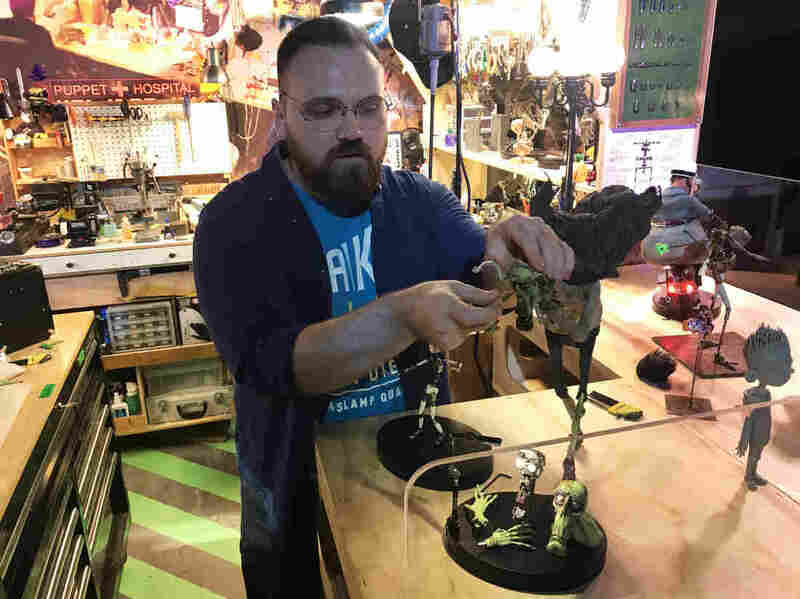 The installation itself featured sets and models from Coraline, ParaNorman and Kubo and the Two Strings, but a highlight was the recreation of the studio's "Puppet Hospital," where broken stop-motion puppets are repaired. The exterior to the "Other World" house in the 2009 movie Coraline. It was oddly satisfying (and just a bit macabre) to watch "puppet surgeon" Austen Weitzel casually pop the face mold off a Kubo puppet to demonstrate the way the studio 3D prints face molds so each expression is "bespoke," or custom-made. Weitzel, 26, started at Laika as an intern when Kubo and the Two Strings was just beginning production and helped build the capes for "The Sisters" characters. That brought him to his current specialty: hair and fur, where he says he's learning a lot. When I asked him what materials they use for hair and fur, Weitzel said it all depends on the production and the effect they want. For example, the hair in Kubo was real human hair, but Norman's hair in ParaNorman was made of goat hair arranged around 256 carefully plotted spikes in the model's head. Austen Weitzel, 26, one of Laika's "puppet surgeons," he helps fix the puppets when they break during shooting, specializing in hair and fur. Weitzel started at Laika during Kubo and the Two Strings' production. At the back of the installation was a room with one last set from Laika's newest film, Missing Link. Directed by Chris Butler, who wrote and directed ParaNorman, it stars Hugh Jackman as a monster hunter who teams up with Mr. Link, voiced by Zack Galifianakis, the last of mankind's "missing links" to its primitive ancestors. It's currently set for an April 2019 release.Tonight was also the night I discovered, much to my dismay, that next year will be the tenth anniversary of Coraline's release in 2009. I vividly remember my awe when I saw it with one of my best friends when I was in college, and it was jarring to realize how long ago that memory was made. I imagine it only gets worse from here. Anyway, existential crises about the relentless march of time aside, I'm genuinely excited about the rest of the convention. There are lots of panels to try to see and a giant Artists' Alley to peruse before Sunday. Oh, and cosplay. Lots and lots of cosplay.